31 Dec 2014 - Final race of the 2014 Kansas Cyclo-Cross Season (as well as the 7th and final race of the 2014 Series60CX points series) today again over at Herman Laird Park in Shawnee, KS. Osceola Velo Club's Pat Schlager braved the frigid weather to finish 9th in the Single-Speed Category today which secured his 4th place overall in the Series60CX points series. Here are a couple of photo links of Pat S. -- photo 1, photo 2. 28 Dec 2014 - The Chrismas Week of Cyclo-Cross continued today with the Grote Prijs Shawnee held at Herman Laird Park in Shawnee, KS. The ground was still frozen for the first race of the day, but after that, parts of the course got more wet and muddier with each race. 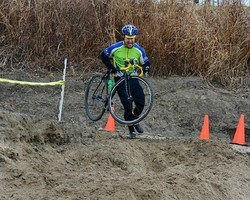 Osceola Velo Club's Pat Schager was there, stayed upright through the thawing course, and finished 10th in Single-Speed. Here is a photo link of Pat S. at the barriers. 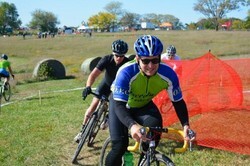 Just one more race of the Kansas Cyclo-Cross Season to go -- Cross Off the Old Year. 26 Dec 2014 - Racing resumed on the Kansas side today with the Boxing Day Cyclo-Cross race held in Leawood, KS. The totally new course this year turned out to be not so technical but rather "heavy." Osceola Velo Club's Pat Schlager was on hand and finished 8th in Single-Speed. Here are a couple of photo links of Pat S. -- photo 1, photo 2. 13 Dec 2014 - Osceola Velo Club's Pat Schlager headed over to Parkville, MO for the Missouri Cyclo-Cross State Championships today. A much better day of racing for Pat S., with another top-ten (9th) in Single-Speed. Here's a photo link of Pat at the sandy stretch along the banks of the Missouri River. 07 Dec 2014 - Osceola Velo Club's Pat Schlager raced at the Fast and Furriest Cyclo-Cross race held at, and to benefit, the Humane Society of Kansas City, KS. The cold, damp weather and the "heavy" course made for a tough outing for Pat S. in the Single-Speed category, but he still managed 7th place. Here's a photo link of Pat goofing off for the camera and one of Pat grinding up a slippery slope. 23 Nov 2014 - Back-to-back days at Cider Mill near Louisburg, KS for the Lost Trail CX. Osceola Velo Club's Conner Rainey 12th Saturday, 7th Sunday in the Men's Cat 4; Pat Schlager 8th Saturday, 13th Sunday in Single-Speed. Check out some photos of Conner R. each day. And here are some photo links of an action sequence of Pat S. grinding up The Mound on his final lap Sunday -- photo 1, photo 2, photo 3, photo 4. 09 Nov 2014 - The 2014 Kansas Cyclo-Cross Season continued this weekend with the area's only "avondcross" (that's Flemish for "evening 'cross"), the Grand Prix HPT which took place Saturday evening on and around the dirt oval at the Heartland Park Motorsports Complex in Topeka, KS, and the Veterans Cyclo-Cross Race on Sunday in Leavenworth, KS. Saturday saw Osceola Velo Club's Ian Pepin finish 3rd in the Jr Men, Conner Rainey 14th in the Men's Cat 4, and Pat Schlager 12th in Single-Speed. Sunday, Ian P. 2nd in Jr Men and 3rd in the Mountain Bike race; Conner R. 6th in Men's Cat 4 and 2nd in Mountain Bike; and Pat S. 13th in Single-Speed. Check out some photos of Ian racing in the dark on Saturday and some photos of Conner on Sunday. 02 Nov 2014 - After a weekend off, the 2014 Kansas Cyclo-Cross Season resumed at Herman Laird Park in Shawnee, KS with the Colavita Cup on Saturday and the Boulevard Cup on Sunday. Osceola Velo Club's Conner Rainey finished 10th Saturday and 8th Sunday in the Men's Cat 4 race while Pat Schlager finished 10th Saturday and 9th Sunday in the Single-Speed. Check out the photos of Conner R. on Sunday. And here is a photo link of an action sequence of Pat S. in Sunday's race -- photo 1, photo 2, photo 3. 19 Oct 2014 - Joules 'Cross took place just outside of Lawrence, KS this weekend with Sunday's races counting as the 2014 Kansas Cyclo-Cross State Championships. Osceola Velo Club's Ian Pepin finished 3rd Saturday in the Jr Men, Conner Rainey finished 2nd in Jr Men Saturday, 9th Saturday and 7th Sunday in Men's Cat 4, while Pat Schlager finished 8th Saturday and 16th Sunday in Single-Speed. Check out the photos of Ian P., Conner R., and Pat S. at Joules. 12 Oct 2014 - Osceola Velo Club's Pat Schlager was on hand in St. Joseph, MO for the Robidoux Roundup Cyclo-Cross Race on a challenging course combined with 'cross-like weather. Pat S. finished 6th in Single-Speed. Here are some photo links of an action sequence of Pat at the bridge/muddy uphill combo -- photo 1, photo 2, photo 3. 05 Oct 2014 - Another full weekend of cyclo-cross racing for Osceola Velo Club, this time at the 360 Cup held at Centennial Park in Lawrence, KS. Conner Rainey and Ian Pepin finished 1st and 3rd, respectively, both days in Jr Men. Conner R. doubled up both days, finishing 12th Saturday and 7th Sunday in Men's Cat 4&5, while Pat Schlager finished 8th Saturday and 10th Sunday in Single-Speed. Here are some photos of Conner R. and Ian P. each day, and here is a photo link of Pat S. approaching one of the climbs on Sunday. That's some good racing, team! 28 Sep 2014 - A full weekend of cyclo-cross racing for Osceola Velo Club at the Cliff Drive Cyclo-Cross Classic held in Kansas City, MO. Ian Pepin snags another 3rd place in the Jr Men on Saturday. Conner Rainey suffered some mechanical issues Saturday finishing 17th but bounced back to finish 6th on Sunday in the Men's Cat 4. Pat Schlager finished 12th Saturday and 10th Sunday in the Single-Speed Category. Here are some photos of Ian P. on Saturday and Conner R. on Sunday. Here's a photo link of Pat S. approaching the barriers at full speed on Saturday. 21 Sep 2014 - Osceola Velo Club scores big at the first race of the 2014 Kansas Cyclo-Cross Season with 3 podiums at the Buffalo Bill Cyclo-Cross held at Havens Park in Leavenworth, KS. Ian Pepin finishes his first cyclo-cross race in 3rd place (Jr Men 14-18), while Conner Rainey doubles up with a 2nd in Jr Men 14-18 AND a 3rd in Men's Cat 4. 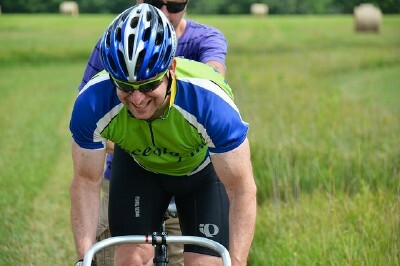 Pat Schalger rounds things out for the team with an 8th place in the Single-Speed Category. Here are some photos of Ian P. and Conner R., and here is a photo link of Pat S. at the barriers. Great racing, team! 02 Aug 2014 - Osceola Velo Club's Pat Schlager was back in St. Louis, MO this weekend for the 2014 Missouri State Track Championships - Match Sprints at the Penrose Park Velodrome. With his new and bigger gears, Pat S. shaved nearly a full second off of his Flying 200 M which qualified him this year for the Match Sprints bracket. Pat put in a couple of good rounds of sprints, cunningly using the banking to his advantage, and ended up in 5th place in the Masters' Category. Check out the photo of Pat crossing the line during his Flying 200 M.
13 Jul 2014 - Osceola Velo Club's Pat Schlager raced in four events at the 2014 Kansas State Track Championship held at the Lawrence Grass Velodrome just NW of Lawrence, KS. Pat S. shaved 3 seconds off of his time from last year to win the Bronze Medal in the Masters' 50-54 500M Individual Time Trial. Pat also improved on his time from last year in "the Kilo" (1000M Individual Time Trial). Pat then went on to finish 6th in both the Age Group Scratch Race and the Category Scratch Race. Nice long, hot day of track racing, Pat. Here's a photo link of Pat at the start of his 500M and one of Pat in is first Scratch Race. 29 Jun 2014 - Osceola Velo Club's Pat Schlager race all three days of the Tour of Lawrence again this year -- the Friday Night Street Sprints, the KU Campus Circuit Race on Saturday, and the Downtown Criterium on Sunday. Pat S. finished as Lanterne Rouge in his category again this year in both the circuit race and crit. Here are a couple of photo links of Pat in Saturday's circuit race on the KU campus -- the opening lap along Memorial Drive, lap 3 on West Campus Road. 24 May 2014 - Osceola Velo Club's Pat Schlager made the drive over to the Penrose Park Velodrome in St. Louis, MO to race in the Timed Missouri State Track Championships. Pat S. competed in a total of four races at the Velodrome -- Category and Age 500M Individual Time Trials, "the Kilo" (1000M Individual Time Trial), and the 3K Individual Pursuit. Pat posted personal best times in each event. Check out the photos. Way to go, Pat! 04 May 2014 - Osceola Velo Club's Pat Schlager raced in the VeloTek Grand Prix, the only timed stage race in Kansas, this weekend, finishing 10th in the General Classification in the Masters' B Category. This stage race consisted of 3 stages -- a short uphill Time Trial, a Criterium, and a hilly Road Race. Surprisingly, this was Pat's first race weekend of the 2014 Kansas Road Racing Season. Here is a photo link of Pat in the Criterium and one of Pat in the Road Race. 26 Jan 2014 - Osceola Velo Club's Conner Rainey wins the 2013 Kansas Best Cyclo-Cross Rider (KBCXR) award for Junior Men! 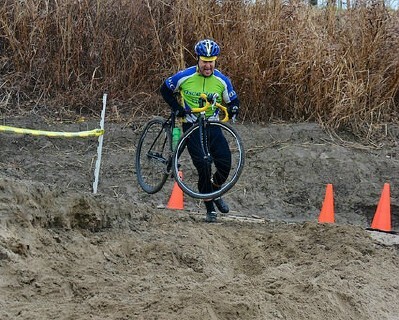 Pat Schlager 5th in 2013 KBCXR for Single-Speed. Osceola Velo Club 2nd in the 2013 Kansas Best Cyclo-Cross Team (KBCXT) for Junior Men! Check out the photos from the KCA Annual Awards Banquet.